On March 17, 2016 Randy Williams’ charges of murder were dropped and he was immediately released. After a 10 month investigation, re-interviewing witnesses who had recanted their testimony, and collecting evidence, we were able to witness another man set free after 9 years in prison for a crime he did not commit. We acknowledge the hard work of appellate attorney, Richard Mischel, defense attorney, Michael Farkas, and civil rights and wrongful conviction attoneys, Paul Callan and Martin Edelman. We also acknowledge another mother who never gave up on her son, Rosie Benjamin. 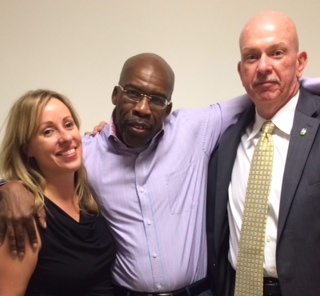 After working with our client, Jonathan Fleming, for one year we were able to uncover evidence which was turned over to the Conviction Intregrity Board and the Brooklyn District Attorney which resulted in his exoneration on April 8, 2014. The media coverage was overwhelming throughout the nation and globally. We were able to spend much of the first week with Mr. Fleming observing his interviews and enjoying his freedom. February, 2015 The Trouble With Innocence, Documentary film by Yamiche Alcindor. Her account of the wrongful conviction and exoneration of Jonathan Fleming. Management Resources LTD of NY partners Bob Rahn and Kim Anklin are available for interviews and commentary. Please contact ImaginePublicity 843-808-0859 or email: contact@imaginepublicity.com or contact Management Resources directly.